America’s public lands are a national birthright, an exemplar of global conservation leadership, and a tremendous source of local pride and benefit. In the North Fork Valley our National Forest lands are a testament to the foresight of leaders from more than a century ago, and the wisdom of our own forebears. The National Forest lands in the North Fork valley are mostly within the Gunnison National Forest, which is itself part of a larger ‘administrative unit’ of three individual forests often referred to as the ‘GMUG’ or Grand Mesa, Uncompahgre, Gunnison National Forests. Colorado has eleven National Forests, managed as 6 units. As a single unit the GMUG is the largest. (However, the White River National Forest is the largest single National Forest in the state). The Grand Mesa, Uncompahgre and Gunnison National Forests are a combination of separate National Forests located on the western slope of the Colorado Rockies. These three combined Forests cover 3,161,900 acres of public land in the central and southern Rocky Mountains, an area that lies south of the Colorado River and west of the Continental Divide with some of the most spectacular scenery in the Rockies. 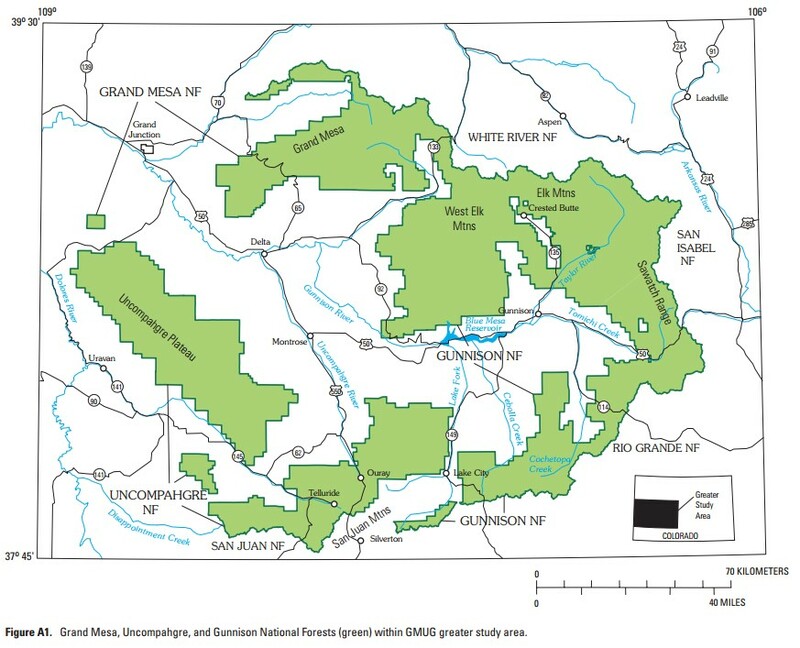 The Gunnison and the Grand Mesa National Forests are nearest to the North Fork Valley, and include lands within the river’s watershed. Thus their histories are the most connected to the communities here. Both forests began before there was a U.S. Forest Service, as federal ‘forest reserves’ under the Bureau of Forestry, dating back to the earliest days of white settlement in the valley. In the Paonia district aspen is largely used for fruit boxes. The creation of the reserves was tied directly to the need to protect resources on the land to benefit the public. Scientists and the American Forestry Association advocated better management of the nation’s forest reserves. The Forest Reserve Act of 1891 had mixed purposes — to protect watersheds from erosion and flooding, and to preserve the nation’s timber supply from over-exploitation. And one of the primary rationale for the creation of the Gunnison Forest Reserve in 1905 was the amazing fruit of Colorado’s North Fork Valley, and the potential for more agriculture in the region. 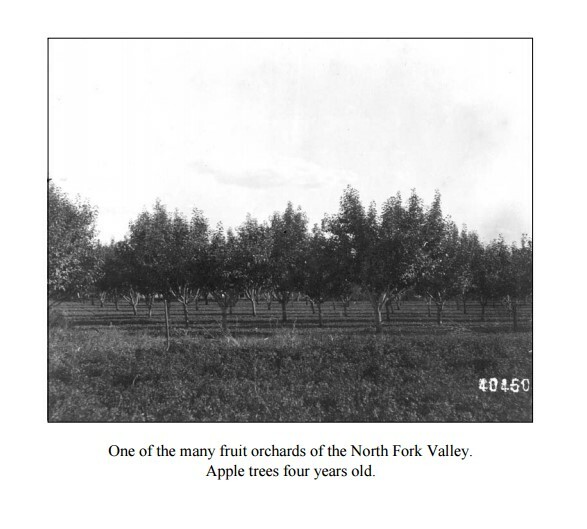 The orchards of Colorado’s North Fork Valley were already attracting national attention in 1904. 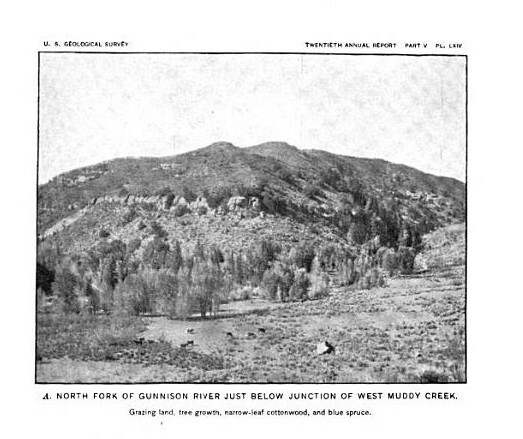 In view of the evidence that the success of the fruit industry of the North Fork Valley and that of the Gunnison Tunnel Project depend on the preservation of the forest growth on the watershed of the Gunnison River, while local industries also need their timber supply protected, and since no lands have been included which are valuable for agricultural purposes, it is strongly recommended that the proposed Gunnison Forest Reserve be established, the boundary thereof to be as shown on the accompanying map. The value of the forest as a protection cover is clearly shown by the experience of the people of the North Fork Valley. Several years ago the ditches which drew their supply from the North Fork became very short in their supply. The fruit growers, on investigating, found that the herders who were running large bands of sheep on the watershed of the river were setting a great many fires that destroyed the forest cover over many large areas, thereby causing the snows to melt early and rapidly, flooding the streams in the early spring and failing in the summer when water was most needed. After convincing themselves of this fact, the North Fork Fruit Growers Association went to the sheep owners in a body and informed them that they would be given one season to remove their sheep from the watershed. This the owners agreed to do, but during that last season the herders burned off the larger portion of the watershed of Minnesota Creek and the following year, although the rain and snowfall was normal, this creek fell off half in its summer flow. This was proved by actual measurement. This expensive object lesson thoroughly convinced the farmers and fruit growers of the importance of forest cover to prolong stream flow and it seems unnecessary to give further evidence in this report. While the Gunnison National Forest (and Uncompahgre) date back to 1905, the national forest lands on the Grand Mesa are even older, set aside by President Benjamin Harrison in 1892 as the Battlement Mesa Forest Reserve, the state’s oldest. A 1900 U.S. Geological Survey publication, an excerpt from its ‘Twentieth Annual Report’ entitled the White River Plateau and Battlement Mesa Forest Reserves includes some fascinating descriptions of the forest resources and early settlements of the area. In these early surveys, not much longer than a decade after settlers first moved into the North Fork Valley, the mesas sloping into it and off the southern flanks of the Grand Mesa were noted by the federal surveyors for their high agricultural appeal. 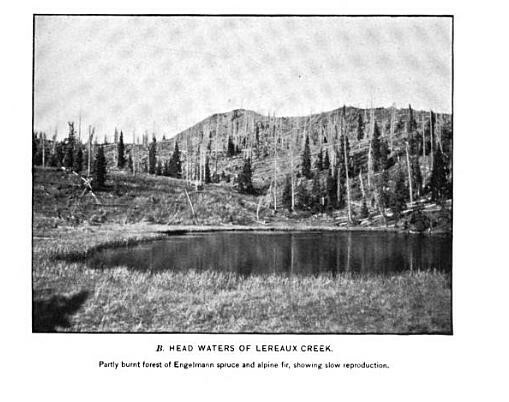 And recreation was already recognized as another use of the nearby national forest lands, with the 1900 report noting the presence of a hunting lodge with a ‘proprietor’ in the vicinity of Leon Lake on the Grand Mesa. As the young nation was contemplating its system of ‘forest reserves,’ according to the 1904 Gunnison Forest Reserve proposal agriculture was the main use identified for the North Fork Valley that the forest reserves would benefit. The forest lands and cover above these mesas were identified as critical to protecting the area’s water supplies, commercial hunting was a recognized public use of the lands, and the need to balance uses (between grazing and irrigation, for instance) was an issue the federal land agency was already seeking to resolve. And although the 1900 survey did identify the likelihood of coal in the upper North Fork, at the time it was considered a limited, domestic use, resource. The origins of the Grand Mesa National Forest and some of the lands in the Muddy Country on the Gunnison National Forest today, lie in the Battlement Mesa Forest Reserve. The Uncompahgre and Gunnison National Forests began as reserves as well. Familiar with the recreational value of the lands, and having already visited Western Colorado on a hunting excursion just months before, in June 1905 President Theodore Roosevelt created the Gunnison, Cochetopa, Uncompahgre, and Montezuma Forest Reserves. Created under authority given by Congress in 1891, the nation’s forest reserves lands were mostly without management direction under the General Land Office until 1897, when the first national forest management law was enacted. The reserves and their management were further consolidated and clarified with the creation of the U.S. Forest Service in 1905, within the Department of Agriculture. In 1907 Congress further defined the president’s authorities to create forest reserves, renaming them National Forests. The Gunnison and portions of the Cochetopa Reserve are the precursors of the Gunnison National Forest today, named after explorer John W. Gunnison. The Uncompahgre, and part of the Montezuma Reserve, are now the Uncompahgre National Forest, from the Ute name for the valley and plateau to the west, and the river that drains it and some of the northern slopes of the San Juan Mountains, which joins the main stem of the Gunnison at Confluence Park in Delta. There are over 100 lakes on the Grand Mesa, many of them old craters and as yet unfathomed. The cool, invigorating weather good fishing, and attractive surroundings draw many summer visitors from the warm lowlands nearby, as well as from many distant places. The numerous resorts on the Gunnison River provide accommodations for those who have neither time nor facilities for trips to the higher, more remote fishing streams, and there is much travel over the Taylor Park road, which has recently been completed. Two other main roads cross the forest, one from the town of Gunnison across Black Mesa to Crawford and Hotchkiss and another via Crested Butte over Kebler Pass via Somerset to Paonia in the valley west of the forest. Further consolidation and reconfiguration of the National Forests occurred through the 1930s. In the 1970s several National Forests were combined—and in many cases were joined into even larger ‘administrative units,’ such as the GMUG. The North Fork Valley’s history is entwined with the story of our public lands—including the national forests that for more than 100 years have been a part of our shared American heritage, established to be managed in a sustainable way that balances the need to safeguard water resources, to maintain healthy fish and wildlife habitat, to provide range for livestock, and to offer opportunities for recreation as well and for prudent resource extraction where it meets a public need. At times, and too often, special interests and those that seek foremost personal gain have bent management of the National Forests toward selfish ends, and even away from the public interest. Others advocate for hare-brained schemes to ‘transfer’ lands out of public ownership. Still, our National Forests themselves remain an enduring American legacy and a tribute to those that had the foresight, more than 100 years ago, to ‘reserve’ them for their shared and enduring values. Now it is up to us to keep them that way.